Oil and Water are miraculously combined in the photographic landscapes of Michael Flomen, Evan Lee, and Laura Millard. An impressive range of artistic processes are brought to bear on natural phenomena. 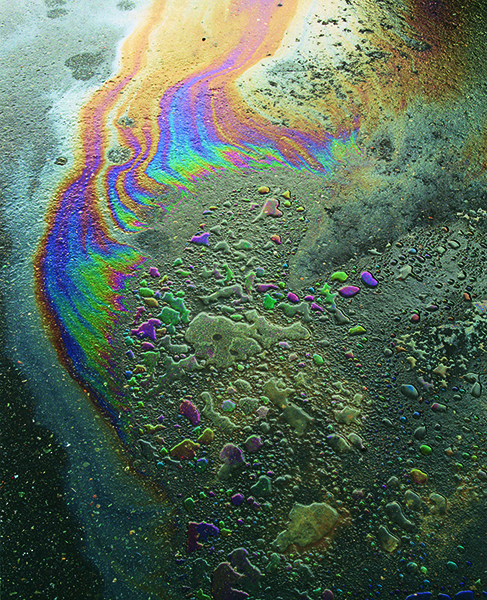 In Stains (2002-3), Evan Lee casts his eye down at the city streets, finding rainbows and solar systems where oil has dripped on water, and been penetrated by light. This familiar phenomenon takes on monumental proportions in Lee’s colour prints. Realism verges on abstraction. These imaginative processes sparked by natural phenomena and expressed in fusions of media become sites of free association and self- discovery for the spectator. Evan Lee was born in Vancouver in 1975, where he lives and works. He uses photography to examine the visual possibilities of the irrational by mingling experimentation, humour, and play with rigorous pictorial and conceptual methods. In 2000 he received an MFA from the University of British Columbia. Solo exhibitions in Vancouver have been organized by Or Gallery, Centre A, Monte Clark Gallery, and Presentation House Gallery. His work has also been included in group exhibitions at the Morris and Helen Belkin Gallery; the Vancouver Art gallery; Consolidated Works, Seattle; and the Liu Haisu Art Museum, Shanghai.